Leave it to Alexis Murphy to come up with the perfect dips to have for the first game of the NBA Championship, with the Golden State Warriors taking on the Cleveland Cavaliers tomorrow night. Writes Alexis on her website: “The Golden State is ready to hoop it up for the NBA Finals. I’m jump starting the festivities, by getting some game day snacks ready for the Dub Nation. “You can’t serve golden veggies without a touch of Curry. And a little assistance from Green. 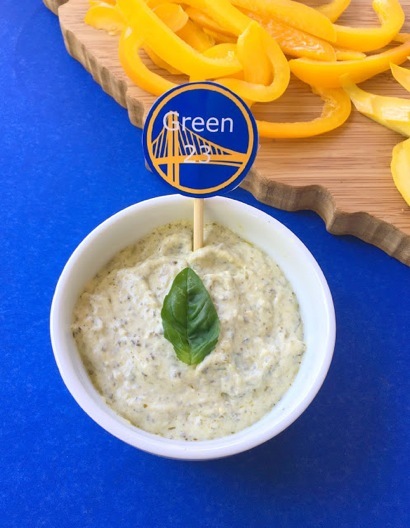 “Draymond’s dip is 2 Tablespoons of store bought pesto, stirred into 1/2 cup sour cream and topped with basil. “And Steph’s Sauce is 1/2 cup nonfat plain Greek yogurt with 1 tsp curry powder and a dash of salt. Gosh, I hope that Alexis Murphy included in her recipes, Organic veggies…..oh wait….they just recalled thousands of pounds of frozen “organic” veggies. So much for the organic theory of growing!! !